Posh chairman Darragh MacAnthony (left) and chief executive Bob Symns. 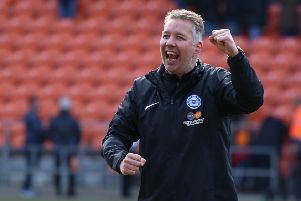 Peterborough United chairman Darragh MacAnthony is seeking inspiration to improve the matchday experience from the club’s fans. For instance, MacAnthony is aware many fans felt let down by the way the club sold their 4,000 ticket allocation for the FA Cup tie at Chelsea. Posh are seeking inspiration from their fans. He held a brainstorming meeting with his backroom staff this week to ensure failings on tickets, catering and other matters aren’t repeated. And he’s asked the club’s supporters to send their ideas to him through phil@theposh.com. He’s promised to read every suggestion and implement the best. He will give three free season tickets for the 2017-18 campaign to the fans who come up with the best ideas. MacAnthony has already agreed to host two season ticket holders in the directors’ box (home and away) each week. MacAnthony made the announcement on his popular Twitter account. He said: “I had a really good meeting with many of the staff about match day tickets, next year’s seaons tickets, fan engagement, Chelsea ticket issue, ticketmaster, changes for next season, events, fan experience on match day, a few shakes-ups internally and I’d like you, our fans, season ticket holders and non-season ticket holders alike, to share some ideas in the coming few weeks with me. “I promise to read/hear every one of them and hopefully be inspired by some of them. Our fans are our number 12 and at times they feel unappreciated. “The three best ideas will lead to a free season ticket for 2017/18 season presented personally by me. “One quick note, don’t just write ‘make everything cheaper’. It’s not always the answer, but I’m all ears/eyes so to speak. “To kick it off, Alex (Harris), our commercial manager, came up with a good idea and I’m going to choose two season ticket holders each week to sit free in the directors box.